THE FULL BIRD COUNT IS IN! 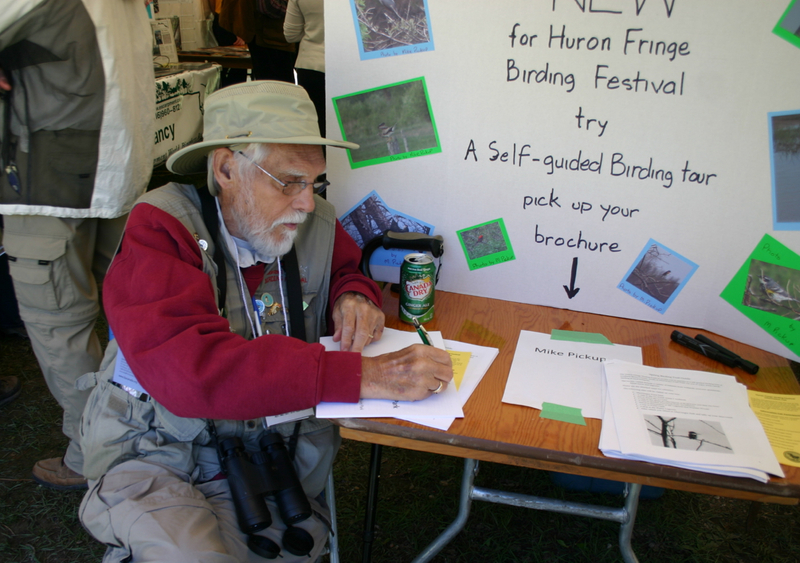 Or visit http://www.friendsofmacgregor.org – open Huron Fringe Birding Festival – select – Birding Species List. Either link gives you the complete list of species sighted over 17 years at the Festival. Thanks to Mary and Tony Rapati, James Turland, Bruce Edmunds, the Bruce Birding Club and all Festival birders over the years for helping our species list grow. suggestions. Your answers are giving us the kind of data we need to help us further improve the Festival. For those of you who have not yet completed our survey, we would ask that you click on this link: https://www.surveymonkey.com/s/8HLDDHB to access an online version. Only ten questions and your submission is, of course, anonymous. SCHEDULE OF EVENTS AVAILABLE FOR VIEWING – JANUARY 15, 2015. “Well, we’re off to a late start.” So said a smiling Jim Duncan, outgoing Chair of the Huron Fringe Bird Festival organizing committee, of this his last meeting. The committee had grown over this season reflecting the pull it has with local birders and naturalists who want to part of a growing and successful birding and natural festival. Point being that the meeting set up was too small to accommodate all present. It wasn’t long before tables and chairs were rearranged and the group got down to review the Festival that just finished. Results are happily stated in the following account by local birding author and legend Mike Pickup. The Huron Fringe Birding Festival came to a successful conclusion on Sunday the 1st, June 2014. HFBF drew approximately 259 registered participants, 104 of which were brand new to the Festival, a record for us. All were treated to two weekends of great weather. With 80 events and 43 leaders, participants were taken on events throughout MacGregor Park, covering all four corners and travelling the many trails on their hikes. Also many hikes traversed on the roads up and down the Bruce Peninsula. The southern part of Bruce County was covered on many outings as well. Places visited ranged from Kincardine and Inverhuron in the south to Dyers Bay, Cabot Head, Malcolm Bluffs and Tobermory including a sold-out tour of Flowerpot Island, in the north. Grey County was also explored near Owen Sound and the Bognor Marsh. Events included Birding Hikes, Nature Rambles, Wildflower Hikes, Butterfly and Dragonfly Hikes, Insect Hikes, Tree Identification Rambles, Photography Hikes, an evening of Astronomy, Fern Hikes, Geology and Geomorphology Hikes and coastal habitats Of the Huron coast. Many attendees commented on how well organized they found the festival, that it was family-friendly and on the quality of the leader’s local knowledge. Our surveys show favourable comments such as: “Having a great time” “Your leaders are great, friendly and knowledgeable” “Fantastic weather and lots of birds” The friendliness and low cost, brings many participants back each year. The overall 2014 attendance was up from previous years. Our leaders are also returnees, with many having been there for a number of years. Naturalists such as Mark Wiecinski, Judith King, Peter Middleton, Doug Martin, Kerry Jarvis, Mark Peck, Michael Carson, Bob Gray, keep returning to lead our hikes. We attracted some new folks as leaders this year that included Marilyn Ohler, Nobert Woerns, Judith Jones, Mike Burrell, Bill and Lynne O’Keefe, David Lamble, Sheila Colla, Mike Cadman, Barbara Palmer, Justin Peter, Tanya Pulfert and Catherine Jimenea. Our workshop and evening programs covered topics from Identification of Hawks, The Plight of the Bumblebee, IBA’s Important Bird Areas, Astronomy, Ontario Bird Surveys, A Fling with Shorebirds, and Migration on the Strait of Gibraltar. Our banquet was held on May 24th at St. Joseph Parish hall in Port Elgin catered by Harrigan’s Cartering of Southampton. Our guest speaker renowned Master Bander David Lamble gave and informative and entertaining presentation about Birds and Some of Their Mysteries. As I said earlier the Festival was a success. The 190 species total is a recent high with a late migrating Orange Crowned Warbler seen the first weekend and a Connecticut Warbler singing at the Visitor Centre on the last weekend. During the 10 days of the Festival a total of 27 Warblers, 11 Sparrows, 12 raptors, 9 Flycatchers, 7 Woodpeckers plus 15 shorebirds, along with all the other species, were located by all participants. I would also like to send out great big thank you to our Volunteer Committee that was responsible for organizing the Festival. They have spent many months organizing and setting up the program for all to enjoy. Also a big thank you to the approximately 50 volunteers who helped during the festival setting up the registration tent, working at registration, introducing our leaders, and our hike coordinators without who our hikes would not be conducted. Also a great big thank you to our sponsors for their generosity without whom we would not have a Festival. Thanks to our corporate sponsors, Bruce Power, Ontario Power Generation, and Eagle Optics. Thanks to our local Event sponsors: The Colonial Motel of Port Elgin, Handy Andy of Southampton, Grey Suable Conservation Authority of Owen Sound, Harrigan’s Catering of Southampton, Hills Insurance of Southampton, John King Law Office of Port Elgin, Mild may Tent Rental of Mild may, Natures Millworks of Paisley, The Rotary Club of Southampton, Synergistic Solutions of Southampton, and a couple of new ones this year, The Elk and Finch restaurant of Southampton and The Woodpecker Restaurant of Port Elgin. Please mark your calendars with next year’s dates…22nd May to 25th May and 28th May to 31st May 2015. Registration starts on 1st Feb 2015, with the program being available on line by 21st Jan 2015 on the Friends website at www.friendsofmacgregor.org or follow us on Facebook: http://www.facebook.com/HuronFringeBirdingFestival. Email: birdfest@rogers.com. Anne Cathrae,, Becky Grieveson, BJ Martin, Carole Lipton and Norma Nanni say goodbye to 5:00AM mornings.